This history is reproduced from GML heritage listing application for the Blacktown Native Institution. The Blacktown Native Institution is the earliest remaining example of an institution built specifically to house and indoctrinate Aboriginal people with European customs, and is representative of the origins of institutionalisation of Aboriginal people in Australia. The Institution played a key role in the history of colonial assimilation policies and race relations in Australia. The site is also important to the Sydney Maori community as an early tangible link with colonial history of trans-Tasman cultural relations and with the history of children removed by missionaries. 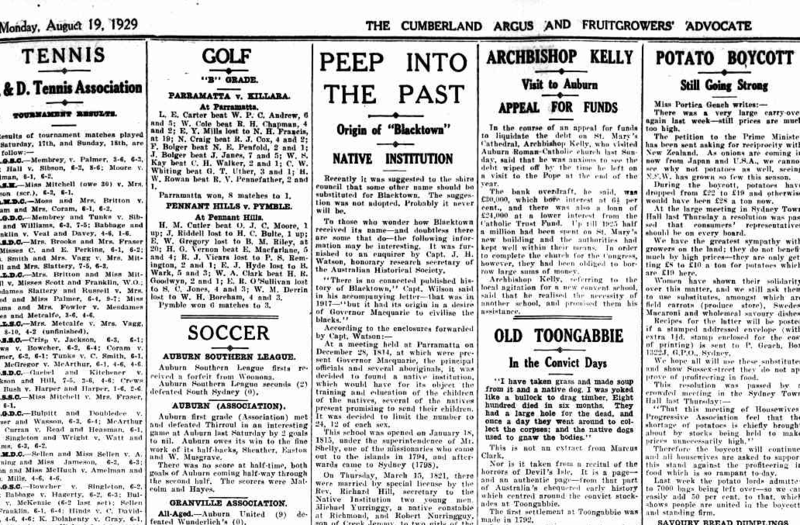 The practices that were experimented with by Governor Macquarie, and which are represented by the Blacktown Native Institution, display the first stage of what was to become significant, long term and controlling policies for the ‘management’ of the Aboriginal population in a post-contact period of Australian history. The site is illustrative of post- colonial laws, practices and policies that were specifically targeted at management of the Aboriginal population in Australia. The institutionalisation of Aboriginal children at the site can also be seen as the genesis of government ideology that would later evolve into forced Aboriginal child removal and what has now become known as the ‘Stolen Generation’. The site has an enduring connection with the Aboriginal community and has a strong social significance for local groups as well as the broader Aboriginal population. The Blacktown Native Institution site is valued by sections of the contemporary Aboriginal community and the wider Australian community as a landmark in the history of cross-cultural engagement in Australia. Community groups and historians are actively engaged with the Blacktown Native Institution site as a place that reflects the history of post-colonial intervention in Aboriginal cultural traditions. For Aboriginal people in particular, the Blacktown Native Institution holds great cultural, spiritual and heritage significance as place that symbolises dispossession, loss and forced child removal. The arrival of the First Fleet into Sydney and the establishment of a penal colony in New South Wales began the intervention policies, political discussions, assimilation programmes, laws and initiatives regarding the Indigenous occupants of Australia. Over the years, many of these attitudes and policies have been highly detrimental to the Aboriginal people and have shaped the course of Australia’s cultural history. When Lachlan Macquarie took up the position of Governor in 1809 he was instructed to “conciliate the affection of the Aborigines and to prescribe that British subjects live in amity and kindness with them” (Ritchie, J 1986, pp 109-110). His desire was to remain on friendly terms with the Aboriginal people and he hoped to exert his authority without using force. His plan was to create a ‘chain of command’ by selecting Aboriginal ‘chiefs’ who would be responsible for the behaviours of their people. He also planned to ‘civilise’ the Aboriginal people and to ‘render their habits more domesticated and industrious’ by establishing a school for Aboriginal children and a small farming community for adults. Central to Macquarie’s vision were plans to provide land and farming equipment to select adult Aboriginal people who wished to farm and create a small European style Aboriginal village. 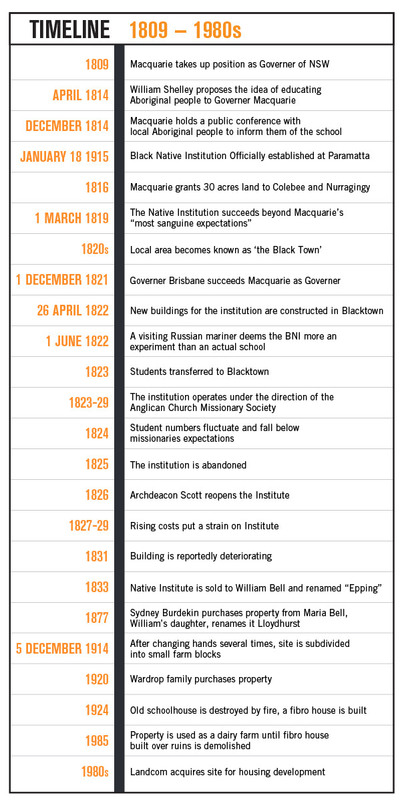 On 10 December 1814, Macquarie gazetted the rules and regulations for the Native Institution. The Parramatta Native Institution opened on 18 January 1815 and was then transferred to the Blacktown location, which operated between 1823 and 1829. This site was one of Governor Macquarie’s first attempts at managing the relationship with Aboriginal people and is the site of the earliest remaining institution built specifically to house and indoctrinate Aboriginal people with European customs. From the outset, the policies developed were intolerant of Aboriginal traditions and assumed that European philosophy and traditions were of a superior nature. In his official letter, dated 10 December 1814, to his principals in England, Macquarie stated, “I deemed it an act of justice, as well as humanity, to make at least an attempt to ameliorate their condition and to endeavour to civilise them in as far as their wandering habits would admit it”. His idea was for the ‘civilisation of these natives of both genders to be brought up in the habits of industry and decency’ (Macquarie to Bathurst 1814, Historic Records of Australia Vol, VIII:367-70) . The basis of Macquarie’s experiment revolved around imposing European ideas of culture and behaviour onto Aboriginal people with no understanding of their life, traditions or culture, as well as separation from European society, was doomed to fail. This site is the earliest remaining example of an institution specifically aimed at removing Aboriginal culture and represents the Colonial Government policy that would go on to have severe, irreversible and damaging impacts upon the Aboriginal population. The policies that were experimented with at this site informed future policy and would eventually lead to further attempts at institutionalisation, dispossession of land and cultural loss for the Aboriginal population. This site is an outstanding example of the European intervention in Aboriginal life, and represents the earliest form of public policy specifically aimed at eliminating Aboriginal cultural traditions and enforcing assimilation with a European way of life. The establishment of the Blacktown Native Institution is a key event in the context of the Colonial Government’s attempts to specifically control, assimilate and ‘Europeanise’ Aboriginal children. From the earliest days of European occupation Aboriginal children were targeted by the administration and missionaries to instil European values and work habits in them. Macquarie’s plan to ‘civilise’ the Aboriginal children and make them ‘useful’ in their habits through removal of their culture was expressed in the creation of a school for Aboriginal children and a small farming community in Blacktown. With the closure of the Parramatta site and the opening of the Blacktown Native Institution it is evident that the administration was convinced of the benefit of institutionalising Aboriginal children. “That no Child, after having been admitted into the Institution, shall be permitted to leave it, or be taken away by any Person whatever (whether Parents or other Relatives) until such time as the Boys shall have attained the Age of Sixteen Years, and the Girls Fourteen Years; at which Ages they shall be respectively discharged” (Bonwick Transcripts 13 (Mitchell Library SLNSW), 10/12/1814 pp916-22). The Blacktown Native Institution is one of the first known sites where Aboriginal children were removed from their parents (including under duress and by deceitful methods), and institutionalised – a practice that continued until the 1970s. There is strong evidence to show that methods of persuasion were required in order to conscript children to the Institution and this reflects the commencement of the historical process of forced Aboriginal child removal. Whilst the control of the managers at the Institution was evident, and despite allegedly volunteering enrolment of their children, parents and family members invariably returned in attempts to take them away again. What may have been an initial attraction for Indigenous families to place their children in the Institution had, within a few years, evoked a hostile response when it became apparent that its purpose was to distance the children from their families and communities. The policy of removing children from what was perceived as ‘bad influences’ and ‘poor circumstances’ to create good and useful citizens without contact with their family was a practice that would have long term and irreversible impact on Aboriginal people. The harm continues in later generations, affecting their children and grandchildren (Commonwealth of Australia 1997, Bringing Them Home). 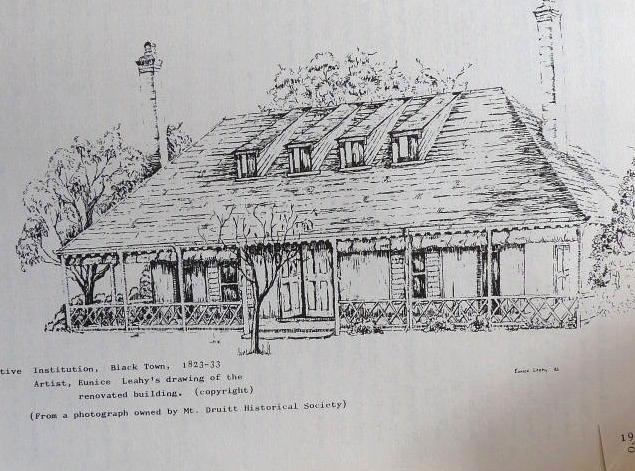 The Blacktown Native Institution is highly significant as the earliest remaining example of an Institution designed to house and educate Aboriginal Children in European traditions, with the intention of eliminating Aboriginal customs. The enrolment and detainment of children in the Institution represents the earliest attempts to remove Aboriginal children from the influence of their families and traditions, and is representative of the government policies and ideology that would result in forced removal of children and what is now known as the ‘Stolen Generation’. Adjacent to the Blacktown Native Institution Site is the location of the first ever Aboriginal land grant in Australia’s history to two Aboriginal men, Colebee and Nurragingy, by Governor Macquarie in 1816. The land chosen by Nurragingy was part of the traditional lands of his people and lay west of Parramatta on the Richmond Road. Nurragingy lived on the land with his wife Mary and sons Bobby and Billy, farming and living in a hut provided for him by Governor Macquarie. The location of the Colebee/Nurragingy land grant directly influenced the choice of the site of the Blacktown Native Institution, which purposefully sited opposite to the land grant. Nurragingy stayed on the land in the area that became known as Blacktown until the late 1820s. The site of the Colebee and Nurragingy land grants is representative of the relationship between Aboriginal people and the Colonial Government, and is an example of the first attempts of Aboriginal people engaging with the colonial administration in order to establish their independence. While this site has not been included in this nomination, it is important to recognise the importance of the land grant and the associated values the two sites share. Further research would be required to establish whether or not the Colebee and Nurragingy land grant be included in a larger National Heritage assessment boundary. Hello Margaret, I suggest you contact Darug Tribal Aboriginal Corporation (DTAC) who have the geneaological records (see Kohen, 2009, p. 3) which include the Goldspinks and Peggy (Margaret) and a photo of her with family members, on p.4. If you ring 9622.4081 during business hours early part of the week, as it is manned voluntarily, so some days there may not be a pickup.